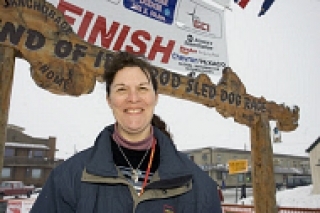 Hello Teachers: Read Lynne’s introductory letter to welcome teachers to a year of Iditarod learning! Hopes & Dreams: Any grade level, One of the first lessons of the year is to discuss dreams and hopes, asking each student and teacher to state the most important school goal for the year. These are written, illustrated, and published. They remain a focus for rule creation and to inspire the class for the whole year. Your Team: Cooperative Learning, Any Grade level: This lesson introduces different types of teams and establishes the qualities teams require to be successful. Each student will be placed into a team for the school year. Time will be set aside for research into the culture, which will culminate in the Native Day! at the end of the year, showing a celebration of the culture. Native Days: The students will have an ongoing working group where study takes place on their Native group. Partway through the school year the teacher will announce it is time to begin planning their final celebration. Ideas will be organized and the group will plan a way to teach the others about their culture. The final projects will be the end of the year celebration. Alaska Day: Students will learn about the history and celebration of Alaska Day and will compare it to known festivities. Iditarod ‘Ad Libs: After a review of the parts of speech, the children will compile a list of several of each, review for accuracy, and insert them at random into an Iditarod “blank” story. Celebrate: The students will brainstorm types of celebrations. After studying various important events in their own state history, each group will choose an event and decide how to represent it with a student designed celebration. The group will create an invitation and a day of celebrations will culminate the research. Timeline Project Introduction: After reading The Great Serum Run, the children will recall an important event in the book. These items will be sequenced and the story retold in preparation for other Timeline lessons. Timeline Dateline: The students will list at least 10 events of importance in their lives. After discussion, they will select 8 that they wish to put into their own timelines. With parental assistance, the events will be dated and sequenced. Final copies and illustrations will be completed, and individual timelines will be created. A Native Story: The teacher will read various Native stories and explain the storytelling use of visualization and voice. She will tell a story. Students will choose, rehearse, and tell a story from the Alaskan Native culture near their checkpoint. Are There Walls in Alaska? This lesson introduces the WALLS unit, a yearlong discovery of walls throughout the world. The children will brainstorm various uses and types of walls, learn about a new wall every week, maintain a WALLS journal, and prepare to discover walls in Alaska that can become part of a large classroom WALLS book. This will culminate in the lesson Alaskan WALLS. Weathering the Trail: The class will maintain a yearlong temperature chart showing highs and lows at home and along the Trail. Each student will be responsible for creating a graph illustrating the data. The Giant Cucumber: The Giant Cabbage by Cherie Stihler, Cucumber seeds, planting medium, containers, grow lights, timers, rulers, Science notebooks, sprouting and growth chart, final assessment paper. This lesson will show students how plant growth is dependent on the number of hours of light. Checkpoint Project: The students will read about, locate, research, write about, and present individual studies about checkpoints. This interdisciplinary unit will introduce such diverse subjects as history, geography, population, topography, Native populations, descriptive writing, graphic representations, and oral presentations. Going Shopping: The students will study the mushers’ cost list and will calculate the costs of three musher essentials contained in checkpoint drop bags including dog food, booties, and mushers’ food. A Musher’s Vocabulary: The students have learned how to look up words in the dictionary, and this lesson will review these skills. Musher Folders: Our version of the musher folders contains the following items: a map of the Trail which is updated daily during the race with dog prints, Trail mileages, the biographical information printed from the Iditarod website, pictures and information from other sources, a completed “My Musher” worksheet, and any communication from the musher (or Zuma). Interview Lessons: The students will read interviews with famous people and compile a list of questions common to those interviews. A list of special questions for varied interviews will be developed and practiced. The Name Game Lesson: Introduction: The children will read The Name Jar. They will attempt to match names with their original meanings, and will complete a worksheet about their own names, the story of why they were given it, and what it actually means. Checkpoint Name: The children will find out what the word “Iditarod” means, and will research the name of their own checkpoint. My Town, My Checkpoint: The teacher and students will brainstorm ways to gather information on our town, study travel brochures to elicit ways of presenting the data, and create a brochure as a template for individual student projects. Tailing the Tale: The class will assemble a list of homonyms and create an Iditarod class book illustrating them. Newspaper on the Trail: The students will learn the various parts of the newspaper and create these parts to compile a classroom Iditarod-based newspaper. Alaskan Walls After studying WALLS for most of the year, the children will nominate examples from their Alaska studies discovered during research. These WALLS will be studied, presented, and included in an Alaska WALLS big book or display space. Life Cycles in the Zones: The students will learn about different growing zones, research one plant growing in Alaska, write and illustrate it, and add it to a larger Alaskan map. Dog Hall of Fame: The children will become familiar with the Dog Hall of Fame at the Knik Museum, and after research, will nominate and write up their own entry for the Dog Hall of Fame. What’s Your Totem? The children will learn a history of totem pole creation by Native people, visit websites with many totem poles and their stories, listen to the story The First Totem Pole, and select important crests to represent their family to create their own totem pole. ABC’s of the Iditarod: The children will research, write, and illustrate an ABC book on the Iditarod. Tall Tall Tales The genre of the Tall Tale is introduced to the children with special emphasis on “exaggeration”. The class will analyze examples of Tall Tales and the students will complete a graphic organizer for their own story. The unit will culminate in a “Tall Tale Tea” where children will read their stories to an audience. The Most Important Idea: The class will summarize all the various learning that has taken place in the year. The children will be informed of their final project, which is to create a final product from a choice of four. These four should align with various learning styles, and should appeal to various intelligences. The final products will be presented as groups of each choice.